What would you pay for a PC gaming accessory that could monitor your PC temperature, control program-specific volume levels, display your instant messages and juggle custom-made shortcut keys without taking you out of the game? Roccat's Power-Grid app does all of this, and it won't cost you a dime. Teased via a website that asked, "Isn't PC Gaming Dead? ", Roccat's answer to that question is a resounding "no". "PC gaming is alive and well," Roccat co-founder and CEO René Korte told me during a recent interview. "It just needs to keep evolving." 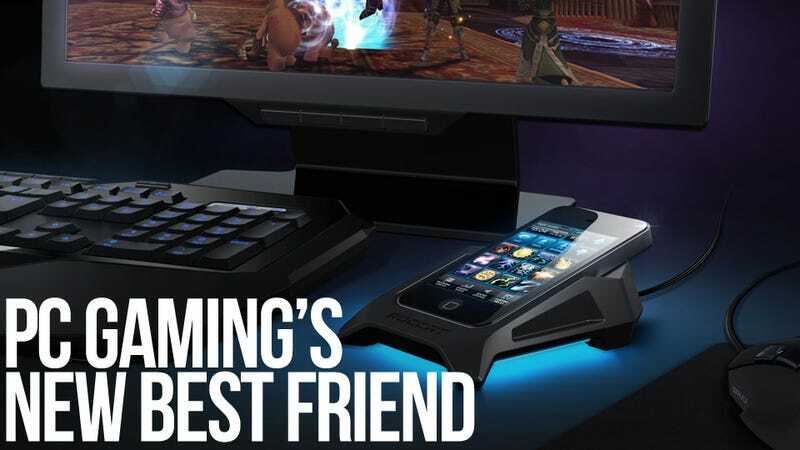 Hence the evolutionary Roccat Power-Grid, an application for your smart phone that allows you to connect, monitor, and command your PC from the screen of your iPhone. How does it work? Let's follow the company line. Every day hundreds of thousands of PC gamers use programs like Skype or Teamspeak to communicate with squad or guild members, coordinating complicated battles via voice while whatever game they're playing takes up the entire screen. In the heat of battle it can be quite confusing, telling which shouting voice belongs to which on-screen character. Power-Grid takes the confusion out of these situations by placing these communication applications on the screen of your smart phone. You'll see who is speaking. You'll see text messages from players without voice. You'll even be able to field communiqués from other chat programs. These are things you can do on your smart phone without the Power-Grid, sure, but Roccat's application allows you to mix-and-match functions, creating custom configurations for every occasion. Want to keep track of your CPU temperature, hard drive space, or network usage in the middle of a game? Boom. Power-Grid effectively does away with the need for expensive LCD screen embedded keyboards or those fancy PC cases with monitors built-in. Handy functions, not something I would use on a regular basis, but it's nice to know they're available. Along with the monitoring functionality, Power-Grid comes equipped with a Sound Control grid, allowing players to control every aspect of their PC audio, down to the volume of individual programs. Turn up Teamspeak and turn down the game music when important instructions are incoming, and they crank up your favorite MP3 player when you realize you already know the encounter by heart. By far the most compelling aspect of the Roccat Power-Grid application is the ability use it as a macro pad for your favorite games. The Power-Grid Launcher for the PC features an editor that allows players to create their own custom icons, map them to macros, and then port them to their phone. Once in the phone, gamers can build custom grid configurations for every PC game they play. Build a set for your healer. Build a set for your warrior. Once you've got your grid set up exactly how you like it you can even share it with friends. "Available to a few has never been successful in the PC game." Of course Roccat isn't releasing this free app out of the goodness of its heart. It's in the business of making money, which it plans to do by releasing PC peripherals specifically designed to take advantage of the Power-Grid technology. Peripherals like the Phobo, a keyboard with a smart phone dock built right in, or the Apuri 2.0, a USB dock with the same sort of functionality. But gamers won't need to spend a dime to experience all the Power-Grid app has to offer. They also won't have to wait long; signups for beta test for the iPhone version of the app are live now, with an Android version launching during Gamescom in Germany this summer and a Windows Phone 7 version in the works. Hit up the link below to learn more about this intriguing union of technology.